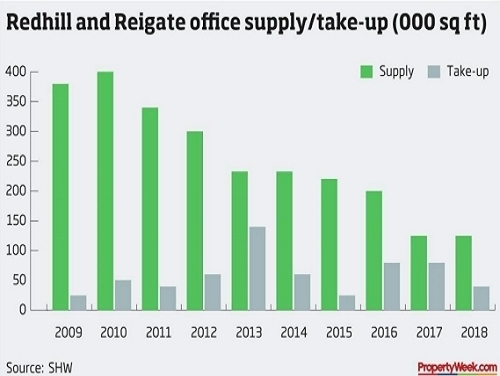 (Originally appeared in Property Week 15 June 2018) Office demand in the Surrey quartet of Redhill, Reigate, Epsom and Leatherhead is characterised by occupiers seeking smaller, smarter space (both in terms of quality and smart working). But overall supply has dipped to one of its lowest levels for many years due to a lack of new development and loss of space to residential. Mark Skelton, agency partner at SHW, says that transactions are generally lease-event driven and there is a tendency for larger occupiers to downsize as they make more efficient use of space while also upgrading to high quality, new or refurbished buildings. Redhill epitomises these trends which have helped it to outperform other towns. Reigate has also performed well, albeit with less activity. SHW data shows that total take-up in these towns last year, at 80,000 sq ft, was similar to 2016 but more than double 2015’s. This year around 40,000 sq ft has been taken up in Redhill so far, with an additional 12,500 sq ft under offer. Lower stock levels have pushed rents upwards, providing sufficient confidence for a small number of new developments, such as McKay Securities’ Prospero in Redhill where rents of over £30 per sq ft have been achieved. The 50,000 sq ft scheme in London Road is almost fully let, having attracted Morrisons, NUS Consulting, Plan Insurance, which is moving from Purley, and Shawbrook Bank, which is merging its Dorking and Croydon offices. Two recently refurbished buildings in Redhill of a similar size to Prospero have benefited from relocations within the town: Aon is to move 500m to 9,000 sq ft in Grosvenor House to take advantage of the better space on offer; Tata is taking 16,500 sq ft at Regent House after being displaced from Furness House, which is subject to residential conversion under permitted development rights. New and refurbished schemes have lifted availability in Redhill and Reigate to 125,000 sq ft (albeit with only 8,000 sq ft in the latter), but this still reflects an average availability rate of below 5% across the two towns. Office availability in Epsom and Leatherhead is higher (at 250,000 sq ft) - but still below 10% of stock - and take-up is lower (at 30,000 sq ft in 2017). Demand is centred on 5-10,000 sq ft offices and small, good quality units of 1-3,000 sq ft, of which there is a deficit. This is especially true of freeholds where owner occupiers are increasingly competing with residential developers. But it’s not all about the smaller end of the market; in a show of confidence, two major employers have opted to stay put in their respective towns. Engineering consultancy WS Atkins, which was bought by Canadian group SNC-Lavalin last summer, is redeveloping its existing Epsom headquarters site for a new state-of-the-art 90,000 sq ft complex. Global IT consultancy CGI-IT UK has regeared on around 70,000 sq ft at Leatherhead Office Park which includes four new leases in Keats House with an expiry date of 2027. The investment is now up for sale at an asking price of over £17m, which would reflect a net initial yield of 7.72%.